Russia could create millions of jobs by investing in clean-energy technology and insulating buildings. Dr. Kandeh Yumkello, the head of the United Nations Industrial Development Organisation (Unido) gives Russia some tips on sustainability. He recently spoke to Russia Beyond the Headlines’ Artem Zagorodnov about his plans in Russia. Russia beyond the Heahlines: What is Unido’s main focus in developing countries? 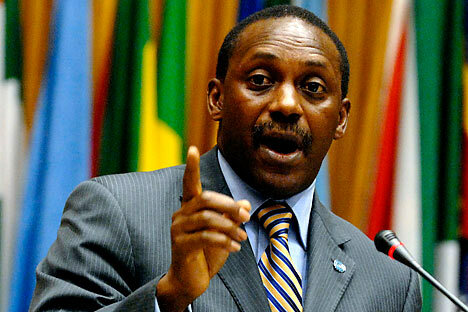 Kandeh Yumkello: We focus on a niche area of industrial development – pollution management and green industries. In today’s context of climate change and resource efficiency in an overpopulated world, these areas are important to help provide solutions to increasing production and consumption. While market forces are important, industrialisation does not occur by accident. From Singapore to the EU, it’s been determined by the leaders. We want governments to mobilise their private sectors to engage in a green transformation. RBTH: How do you envisage this green transformation will take place ? K.Y. : Experts call it a third industrialisation based on green growth. Strong public-private partnerships in green industries are needed, where the state hedges some investment risk while allowing market forces to operate. RBTH: How are Unido’s plans being realised in Russia? K.Y. : We’re pushing a number of projects in Russia focused on green energy and cleanup production. These include a centre for the disposal of hazardous consumer products and industrial waste in the Republic of Tatarstan, and a $1.5m (£960,000) project to improve water quality and reduce the impact of industrial activities in the middle and lower Volga basin. We’re also promoting the production of energy-efficient refrigeration and air-conditioning systems via technology transfer. RBTH: What specific green technology suggestions would you like to see in Russia? If Russian authorities were to adopt new municipal building codes and use public money to build new insulation, they could create millions of jobs. Mayors – like Michael Bloomberg of New York City – will tell you one of their biggest challenges was figuring out how to keep skyscrapers hot and cool. They’ve been thinking about incentives for owners and tenants to be energy efficient. We’re pitching these ideas to wealthy Russians as new business opportunities. The message I brought to the Nevsky Ecological Congress in St Petersburg this year was that Russia has always been a leader in science, but there has not been enough mobilisation for it to lead the green revolution. Russian scientists who can lead this research are out there. RBTH: What long-term challenges does Russia face in the context of green growth? K.Y. : When Russia went through rapid industrialisation, sustainability was not an issue. There are now places where accumulated pollution has killed ecosystems, and contaminated heavy-metal production sites where pollution is seeping into waterways. But technologies to clean up these problems do exist. RBTH: How do you promote energy efficiency while stimulating economic growth? K.Y. : Japan and Denmark have shown you can grow GDP continuously while cutting energy use – the new government in Denmark is pitching green technologies as a way to stimulate economic growth. But I don’t think this mentality has gained a foothold in Russia yet. The government has set up an energy-efficiency programme, and I have heard people ask: “What for? We have lots of energy!” The answer is that there is a high demand for that energy – what you don’t waste, you can sell to other countries.